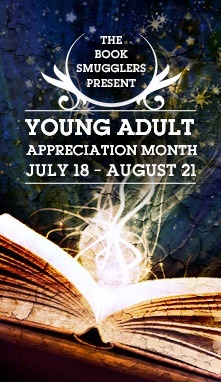 Young Adult Appreciation Month – Join the Party! For the past few weeks, we have been celebrating all things YA with loads of reviews, interviews, guest posts and giveaways. Now it is time to open the floor to YOU, so that you can be part of the party as well! Over the course of the day, this post will be open to anyone with a blog to join in the fun. All you have to do is add your blog name (and the title of your post between parenthesis or at least an indication of what it is about!) and the url of your post in the form below and voila! All the posts will be listed here for everybody to read. Your post can be a review of a favorite oldie, a review of a new (or new to you) YA novel, a post reflecting on the genre, or even a piece on why you DON’T read YA. Anything at all…as long as it is about YA. Oh no! Mr Linky is down for emergency maintenance! Link added ! (I hope it’s okay, my post in in French) Anyway, thank you for that event ! You guys continually rock my socks off. Thanks for lettings us join in on the awesomeness! Oops! I forgot to add the title of my blog post along with my name. The title is “Why I read YA and write it! You gals are awesome! Love the blog. Thanks for the contest! I’m sort of cheating by posting something I wrote a couple of weeks ago but I’ve been doing lot of YA reviews so I guess it still counts. Off to look at everyone else’s ones now! I love YA too. Thanks for celebrating it! My post is an older one I wrote for the Tor blog, but I hope that’s okay. Off to read the other links . . .
Hmm, just noticed that for some reason my link says Suite Scarlett Giveaway, when it was supposed to be Suite Scarlett AND Giveaway. Promise I’m not trying to spam yalls event! There’s a review, plus a giveaway. Sorry about that! I felt guilty for adding an old post so I wrote a shiny new one just for you guys! Here’s my favorite YA book of the year so far, Three Rivers Rising, by Jame Richards. Check out my review! Thanks for doing this! YA month rocks, and the link tree is great for finding out more about why people love YA lit! Wow — it’s been so long since I read anything written for “grown-ups” that I couldn’t decide on a post, so I just linked to my blog. I review lots of graphic novels and fantasy, so enjoy! I linked to my last YA review of Clockwork Angel since I’m planning a giveaway later this week. And I have a Zombies VS. Unicorns review that I was sitting on (wanted to post closer to release date!) probably going up this week too. Great job on the YA month guys! I’ve posted my review of Kiss It by Erin Downing. I hope I’m not too late! I love the variety of posts listed–I can’t wait to read them all. I’ve really been enjoying YAAM, except that my B&N cart is getting awfully full…. Thanks for giving the opportunity! I posted #40 and #42, and apologize for posting twice. Copied the wrong link and ended up posting the inferior post the 1st time around. I apologize.